Over on Willmark's blog take a look at this post The New Shadow- Middle Earth. A lot of great resources and links at this site, very useful. His most recent post about the Old Dark House trope stirs the idea cauldron of my mind and gives me an idea to spring on my players. Perhaps it will do the same for you. Here is an addition to the Retro Clone List. Had to use the Wayback Machine to find these. I thought I remembered something from a few years back and it was not an easy search but here it is. 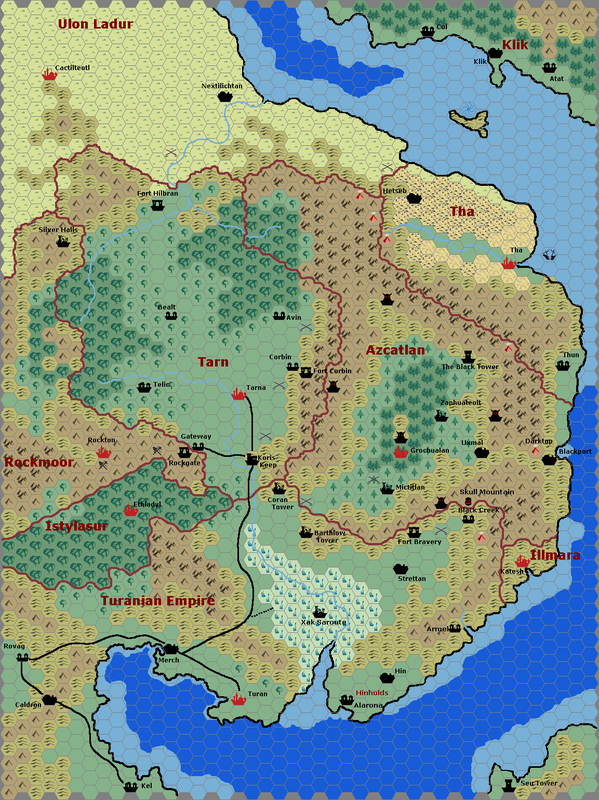 Campaign Setting - the ever-developing "fantasy Christendom" wargames campaign: "Dun Kells." I cannot wait for more to be posted. Roles, Rules, and Rolls - classic games of fantastic adventure Rules & Tools - free resources and a well stocked archive of posts - what more could you want. Coffee swillin' analog gamer this is a blog that I like and although it has been quite as of late, I have every hope that it will resume again. Sham's Grog & Blog - Original D&D Rambling from the Quixotic Referee this is another blog that I like, it has a fantastic archive and it has been quite for going on three years. I have every hope that it will resume again. I hope to over time encourage a lot of great old school blogs to continue or resume their posting. They have voices that need to be heard! Back around mid-2012 I decided to create a Master List of D&D Retroclones and Simulators. For a time it became a very popular resource before it was eventually eclipsed by Taxidermic Owlbear's own list (which was inspired in part by my previous efforts). In regards to last year we saw the release of several mega-dungeons. The long-awaited Dwimmermount, Castle of the Mad Archmage (a sort of inspiration of the old Castle Greyhawk legacy), and soon an upcoming Barrowmaze Complete! I figured that a compilation of megadungeons would be a worthy project. But first we should define what a megadungeon is. My terms are broad: a megadungeon should be a large enough dungeon which could encompass the better part of a campaign for players to explore session after session. Note that while some megadungeons might be spread over multiple products (some of them being more recent Editions), I intend to cover megadungeons built for OSR games or whose legacy is encased with the TSR eras of D&D for the interests of this forum. For those wishing to build their own megadungeons, this thread contains some very useful advice on the matter. Continuing my series on looking at other peoples blogs brings me to Robert Conley's blog Bat in the Attic and not just his blog either, here are some other links of his: The Sage's Tower - The Majestic Wilderlands, Bat in the Attic Games, Thieves of Badabaskor (14 page preview), Judges Guild - Wilderlands of High Fantasy and Points of Light (Preview). There are a lot of resources here, many are completely free and some are for sale. I applaud his efforts on both fronts as I applaud anyone else that is creating old school goodness, those people are to be commended. This blog has been around since 2008 and has a healthy archive of good reading. Another great set of blogs with some twists on things is The Semi-Retired Gamer, author Charlie Warren. One of the highlights of this blog is he talks about Adventures in Fantasy (AiF) by Dave Arneson and Richard Snider. He goes through several posts giving a through description of what is in the box and it looks like the series is to continue and be even more in depth. In addition to that he has a Book of House Rules in Development! There are also posts about a new game Perilous Journeys which I am looking forward to learning more about and he has created a character creation reference sheet for it also. Assorted ideas and resources for the lesser supported game lines of Palladium Books®. Another old school blog and website is the BusyGameMaster along with some thought provoking posts there are also some free downloads and other products. Please take a look, besides the author Gregory B. MacKenzie has old school blood flowing in his veins. Style v.s. Substance in OSR Role Playing, Does it Matter? He raises some questions that require some thought? I might even change my mind about a couple of rules. This post is part 3 of a 3 part post. Over on the blog Smoldering Wizard ~ Old-School Role Playing in a post titled The Many Unique Rules of OD&D, Doug M. (the blogs author) for each of the 3LBBs, creates a list of rules that are unique to OD&D. He has a lot of other posts you should check out, but this one was of direct interest to me. Bitd we did use this rule and the italic above is an interpretation as it is not stated that way, but it is in effect exactly what happens. This rule we never used at all and if I were to implement it, I would reduce it to a 5% chance. I love this rule, never had or needed to use it, but I love it. Never have used this option. I usually have enough other stuff going on, there has never been a need. I always have played this that only humans can not see in the dark. I have always played it that elves, dwarves, hobbits, gnomes etc., can see in the dark. I understand the reason for the rule, which is to force the players to always have to use artifical light - torches and such - which leads to them never being about to surprise the monsters and always being the ones at risk of being surprised. However, an NPC (monster) elf being able to see in the dark, but a PC elf not being able to see in the dark for me breaks that "suspension of disbelief" required for full enjoyment of rpgs. Good catch! I don't recall anyplace else it is mentioned, although we used it for lots of things, especially mummies and trolls. This makes sense to me, it is dark, you are checking for traps, secret doors, the floor is wet and slippery, etc. ; so you will be moving slower. Bitd we never used those at all. The campaign I stared in 2009 spent about 2 years of game time on a ship. I thought it was a lot of fun. Thus ends this 3 part series. This post is part 2 of a 3 part post. Monsters (later clarified to include players who are Fighting-Men - See the 1975 OD&D FAQ from TSR) gain one attack per round as a normal creature against normal men, for each of their own hit dice (“normal” is open to interpretation). Attack bonuses apply to only one such attack. Bitd and currently we always defined nornal men as not being PCs or classed NPCs. A troll was always played by us bitd as a claw, claw and a bite or three attacks every round. Using this rule and calling 1st levels normal men leads to 18 attacks by a troll against a first level party for just the first melee round, so we did not and do not do that. On the other hand we do not give higher level PCs those extra attacks against 1 hit die monsters either. I have considered doing it if I had a group of only experienced players who knew up front that the rule would be enforced. *Only plate armor can be magical. *The author made a correction and deleted this - see his comments below in the comments section. I searched my memory and could not remember anyplace in Monsters & Treasure Volume 2 that stated or implied that only plate armor could be magical, then I went back and read through the entire volume and still do not see anything that would lead to that conclusion. I don't have a non-hobbit printing (6th print OCE) readily available, so I will have to dig one out later and check it also. Yep, that is what it says, but bitd we never once used it that way. Plate armor was AC 3 and magic plate armor +3 was AC 0, we always did that way from the very beginning. Magic shield bonuses only stack with armor bonuses against 1/3 of attacks. This is a rule that from the very beginning bitd we always ignored. We just did not want to spend time making that extra roll on every attack where a shield was involved. The non-protective helms were worn by magic-users in our campaign and since they were unamored anyway it was a non-issue. Bitd we did not follow this in a strict sense at all, we added many, many swords to the treasure table so that at least half of the magic swords in the campaign had a damage bonus, and some only had a damage bonus but no to hit bonus. We always followed this rule. 50% of magic swords are intelligent and will have one or more powers. This means that 50% of Swords had an intelligence of 1-6 and could not communicate and the user had to discover any powers it had, and 50% had an intelligence of 7-12 and could communicate. So 100% have one or more powers. 10% of all magic swords will have a special purpose. We liked this and always rolled for it. Special Purpose swords were fun! Scrolls are for Magic-Users only (there are no Clerical scrolls), although protection scrolls can be used by any player. We always house-ruled that 33% of Scrolls were for Clerics and otherwise kept it the same. Thus ends part 2 of 3 parts. Over on the blog Smoldering Wizard ~ Old-School Role Playing in a post titled The Many Unique Rules of OD&D, Doug M. (the blogs author) for each of the 3LBBs, creates a list of rules that are unique to OD&D. He has a lot of other posts you should check out, but this one was of direct interest to me. (With the number of blogs out there and the number of posts that interest me, I could work 60 hours a week and do nothing but this. However; since I must work for a living, that is not going to happen. Some of you have already sent me links to things that interest me and given time I will try to get to all of those and comment.) This post is part 1 of a 3 part post. A few are carried into Holmes or Moldvay Basic (some as optional rules), but the combined flavor of these rules was never seen again. What I am going to do here is go through and comment on each one of those rules as to whether I use it as it is or do I house rule something else. (Note that I began playing OD&D in Sept of 1975.) Everything showing in quote is in the rules and taken from his post. Yeah, he did the work to pull the information out and I am just commenting on it here. Any OD&D refs out there use this rule? Bitd (in college) we never used this rule at all; however, a few years ago when I started up a new campaign only playing once per month I did it this way before the game, handed the players a few character sheets to choose from and there were no issues with my players doing this. In one playtest I ran for some ideas, I did not even give them a choice of sheets, I just gave them the one I wanted them to run for the playtest, again no issues. What has been your experience with this, if you have done it? Bitd and up to recently I have always used it this way, but I never liked it. Now as noted in my series of posts starting with Money (Treasure), the OD&D Economy & Equipment 001, I am starting to convert to a Silver Economy and as part of that process I am also correcting the coin size and the way encumbrance is measured. This is something in process and the information posted up until today date in that series of posts is not yet in the final form. Have you ever done this? I have done a few, one of which was for dragons. The player wanted to play a dragon and that was a toughy to do since IMC while dragons can be killed, other than death by violence they are nigh on immortal creatures. I worked out a life cycle - part of which is when dragons will "hang" with other creatures such as men and the demi-humans. I will post that here one of these days. Non-player monsters can be subdued or captured and sold. This is something was we did a few times, but was not used very much. I am not really sure why we did not use it anymore than we did. Hit points are rolled anew at each level. This is exactly what we did bitd to start with, but I have also used a multitude of different house rules over the years too. I have done max at first level and then role each level once, max at first level and then roll each level once with a min of 2 per die, max at first level and then roll each level and keep track of each roll so that when you go up a level you get the chance to improve the previous roll. There are no strength bonuses, only a bonus (or penalty) to earned experience for Fighting-Men. When I use just the 3LBBs, this is the way I have always done it. Sometimes I use just the 3LBBs and sometimes I add things from the Supplements. When I use just the 3LBBs, this is the way I have always done it. I have never done this, neither bitd nor currently. Characters are assumed to have one spell book containing all of their spells. Clerics must choose to be either Lawful or Chaotic by 7th level. In the original rules Clerics chose at the time of Character Creation and it was this was for the 1st through the 3rd printing (I have never seen a 4th printing so I don't know which way it was in the 4th printing); however, in the 5th print (IIRC) and later it was changed to the choose by 7th level. I have always played it that players chose at the time of Character Creation. Cure light wounds acts over a full turn (10 minutes). Two things here -one: both bitd and currently I have always played it that the healing acts immediately in the same round the spell is cast and two: one of the first house rules I ever implemented and used (and that was at the very beginning) was to change melee rounds to six sec instead of one min and that made a turn one minute long. I did this because I had seen swordplay in movies and how fast and furious it could be; later on when I saw live fencing matches how fast it could move, I was certain that the house rule was one of my better decisions. In addition, Warriors of Mars used 10 second rounds and it is reported that the original manuscript of Empire of the Petal Throne used one second melee rounds. Bitd I used this and I still do. I have never used it this way, neither bitd nor currently. I have never used it this, neither bitd nor currently. I am not sure why, because I am and was aware of the rule, we just never used it. Thus ends part 1 of 3 parts. The next part of the top down behind the curtain portion of the worldbuilding is to determine the land masses it will have. I started with earth and then extrapolated from there. Here are the seven continents of the world ordered by size. There are about 180,000 islands of less than 190 square miles. I used this as a basis (with some tweaking and extrapolation ) to create continents and islands for the campaign world setting. Only a portion of this has any mapping down as yet. This totals 427,000,000 square miles for continents leaving 26,822,871.503 square miles for islands. Continuing with brief looks at other blogs in my blog list, here are several more than I find to be worthwhile reading, I hope you enjoy them too. The author of this blog started playing in the 1970's and has a lot of useful posts. I don't agree with everything, but I seldom do. :) His latest post is about skills and he has a pretty nifty write-up even though I just use ability checks. He does point out several things that require training. I would agree that calligraphy would require training, so in OD&D at character creation I can ask the player if there is anything they would like me to know about their characters past. If they tell me they are the prince and running away from home to adventure I hand him my dice that let you roll 1 chance in 10,000 and say make that role twice and you can have it. If the player said the character was apprenticed to a calligrapher for several years and when the man passed away his heir told me he didn't need me, hit the road or anything similar to that, I would say sure you can have that. This blog closed down in November of 2011, and there is no easy index to click to a specific post, but if you dig into it a ways there is some really good stuff here. This is ancient vaults (aka bät) blog and right now he is posting new magic items and new spells. Check this out, it is very good. I like his post "10 Books That Should Be On Your Bookshelf " and his picture of what he wishes his Man Cave looked like. This blog is nearly 4 years old and has some good stuff spread over that time period. I hope that in this series of posts you find a blog or two that speaks to you. If that is so, then it was and is well worth doing. In five short years this blog accumulated 2857 posts. It is a gold mine of ideas and commentary. The last post was just over three years ago. If you want to know what happened to the author, google is your friend. I have no comments on that issue, other than those things should not preclude your mining this blog for a lot of great ideas and material. The first link needs updated, the second link is to an invite only blog, and the third link at Robertson Games is a nice long list. The fourth link is to a great series of posts over at the Dragonsfoot forums and is quite useful. The fifth link does not take you to the thread and on top of that is miscredited (No, not because of anything Zenopus did either, he is a stand up guy.). The fifth link is to my thread over at the ODD74 forums and the correct link is a thread by me ThePerilousDreamer: Ye Olde School Blogs which I am slowly adding to. The sixth link is for RPG Bloggers list and it has a lot of information; however the OPML link does not work. This is not a prolific blog by any means; however, everything on this blog is high quality and top notch. This is a very good blog and it has a lot of great scholarship in the way it reports on OD&D. This guy is doing the same thing I am listing tons of blogs; however he has been doing it (since February 2011) longer, listing blogs is his sole focus and has way more of them. He also has a lot of non-English blogs. He is doing a great job and it inspires me to keep doing what I am doing. As I said I will be highlighting other old school blogs in no particular order. My list of blogs is up to 412 as I write this and I am keeping the list in alphabetical order so that I can easily keep track of what I have and also so that the link to a specific blog is easily located. If a link is dead, I will still keep it for a while in case it goes live again. This blogs busiest year was 2009, it has lots of monsters and other things for an ample archive and lots of fun reading. This is a great old school blog, a very good read and a lot of downloadable resources. A very useful site. This blog has slowed down as of late, but it has a lot of archive material from a lot of different contributors. The archives are worth exploring and perhaps its active status will be resumed this year. Continuing to highlight some worthy blogs. Here are some more blogs that I enjoy and find useful as a source of ideas and inspiration for OD&D. In many cases OD&D is not a focus of these blogs, but one of the great things about OD&D is that ideas can be adapted from anywhere. This is a fascinating and professional blog by Bruce Heard , game designer and author. Not an OD&D blog by any means, but well worth a look. A discussion of worldwide lycanthropic spirituality, Irish, other Gaelic, other Celtic, and the other northern European religions, and really whatever takes my fancy. A fun place to go and explore! This blog is strange and weird, you should check it out! Yep, that is what it says! Here are a few of examples that to me just boggle my mind. These four blogs are gaming blogs that are by invite only. I am not sure what the point of this is or if I would understand it, even if I knew. AD&D Grognard Blog - by Invite Only! Weird Lands - by Invite Only! To be fair, James Mishler does have a blog that is not invite only, I don't know about the others.